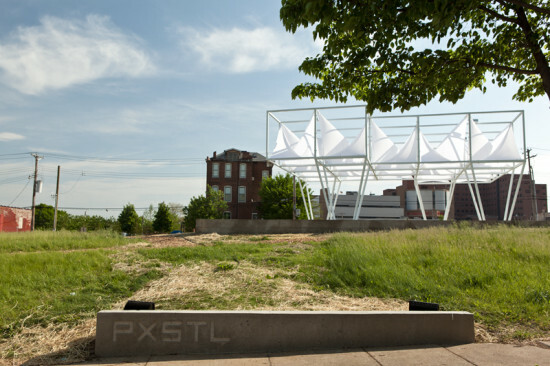 The Pulitzer Foundation in St. Louis will reprise its PXSTL competition, which last year brought an airy, steel-framed pavilion courtesy of Freecell Architecture to the empty lot across the street from the Tadao Ando–designed arts institution. Like last year, PXSTL will be a national design-build competition culminating in a temporary structure on the lot across Washington Avenue from the Pulitzer Foundation. Over a six-month period in the summer of 2017, the winning pavilion will host a series of programs and events organized by the Foundation in collaboration with the Sam Fox School of Design & Visual Arts at Washington University in St. Louis. The winning designers, who will be announced in the spring of 2016, will collaborate with the Pulitzer and a team of graduate students from the Sam Fox School to realize the structure, according to a press release published Tuesday.